Mariana is an 2016 collection dress with a classic Jenny Packham design, V neck, sweet sleeves with all the hand beads all over the dress. It is also an upgraded version of its famous Eden dress. Mariana is a stunning dress and very easy to carry, it is also one of the most beautiful pieces in 2016 collection and has been featured in magazines. The design of this dress will made a bride look at least one size down and perfect for both outdoor and indoor wedding. Outdoor as it’s extremely light and easy to move around, indoor will have bling effect on all the beads. It was 80 degrees on my wedding day and I had an outdoor wedding...I had no problem with feeling overheated in this dress. The dress consists of 2 layers, a silk chameuse as base layer and light tulle with all the crystal and sequins beading. I only wore this dress for 5 hours on my wedding day. It has been professionally cleaned and preserved by the prestigious Margaret's Cleaners in Del Mar, CA. There was very minimal damage--just the typical dirt on the bottom and a few missing beads, all which have been restored. It is in pristine condition! The only alterations done to the dress was a couple inches taken up on the bottom. No alterations done in the bust or waist. 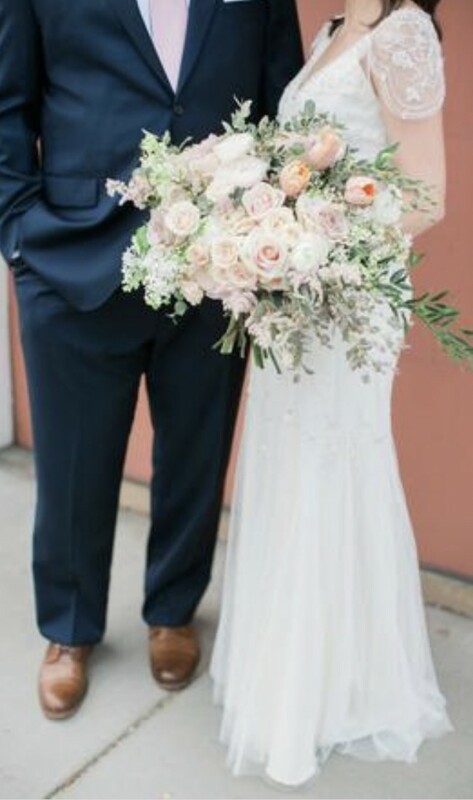 I'm 5'3" and wore 4.5" heels for my wedding day. I had cups put in, but those have been removed so you can add your own.